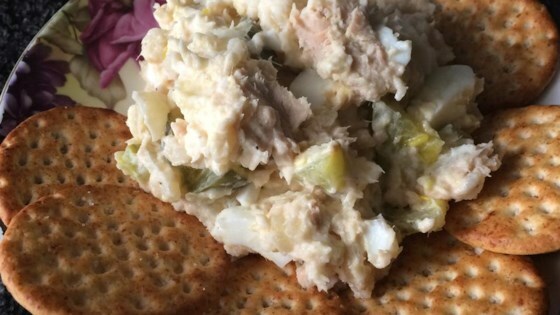 "This salmon salad is a very popular dish served at Russian gatherings and is usually the first one to disappear. It is easy to prepare and can be served at a picnic or as an appetizer." While the eggs are cooking, place the potatoes in a saucepan with just enough water to cover. Bring to a boil, and cook for 10 to 15 minutes, or until tender. Remove from heat, drain, and set aside. Heat oil in a skillet over medium heat. Add onions, and saute until lightly browned and translucent, about 10 minutes. Flake salmon and spread it over the bottom of a glass baking dish or serving dish. Spread the sauteed onions over the salmon. Gently spread a little bit of the mayonnaise over the onion layer. Top with potatoes, and spread enough mayonnaise just to add moisture to the layer. Finally, slice the eggs, and cover the layer of potatoes. Spread mayonnaise over the eggs, and garnish with chopped parsley. If you wish, you can reserve some of the egg to chop and sprinkle over the top as well. Chill for 1 hour before serving. This is very good! My mom is russian and she makes this salad with tuna, plus she adds some grated cheese layer to it, but it's also very good with salmon! I mixed the sauteed onions, salmon, potatoes and mayo together, then served on lettuce with the sliced eggs. Great flavor! Thanks for the recipe! The sauteed onions make this very tasty indeed. A nice, simple, delicious salad. Wonderful luncheon dish. Serve with crusty bread and follow with sliced fresh peaches in champagne.